Furminator review – what is it and how to use it? Pieces of fur all over the house, especially if you have a large sized pet in the house, they become a real problem during molting and hair shedding season. The hair is all over the furniture lining and clothes, carpet and it is in the room corners. FURminator allows to avoid all of above mentioned, decreases duration of hair shedding season, makes your pet’s hair shiny and healthy. In this Furminator review you’ll find answers for the following questions: what is it – FURminator for dogs, how to choose a proper deshedding tool and how to use it properly? FURminator for dogs – this is a real catch for owners of dogs with thick or very pronounced underfur, which becomes a true problem when shedding. Dogs shed their hair twice a year. But sometimes it lasts so long, that the dog after finishing its summer shedding, stops loosing hair for some very little time and starts shedding again to prepare for winter and you have its hair all over the house again. This means that the died out hair still stick to the upper skin layer of the dog. The dog looks unattractive and ill kept, because the dead hair is dull, it tends to become matted and form polish plaits. A dog with such appearance isn’t likely to get any title or some high grade on a dog show. In fact, a shaggy dog with matted hair appears as ill and homeless one. 2 What is FURminator for dogs for? 3 How does FURminator work? More than 10 years ago Angie Porter a professional pet groomer was trying to find a quality and suitable tool to reduce dogs shedding. After trying all possible instruments in her area, she understood that such a tool doesn’t exist. That’s why she decided to design it together with her husband David. 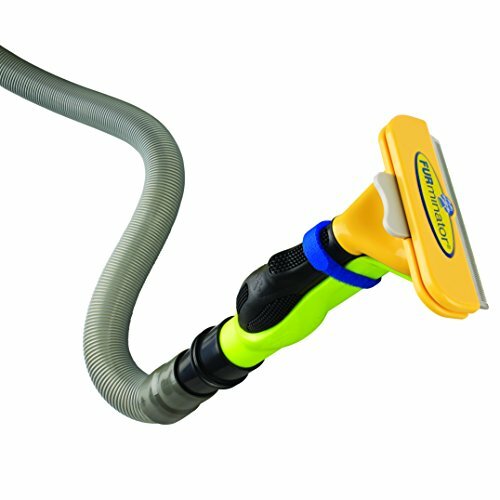 So, together they created the first and the only tool for save, efficient and convenient removal of undercoat and dead fur of an animal, which sufficiently reduces the shedding period: FURminator ® this is a device you can use while your pet is shedding – a popular, demanded and favored deshedding tool on the market. FURminator and its designers continue rising the bar with their own innovative solutions. 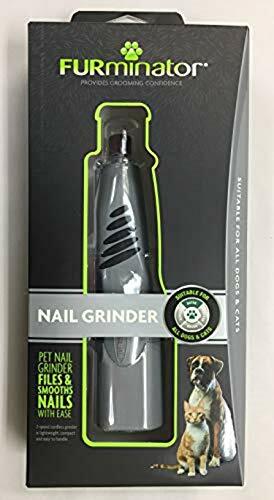 FURminator as a brand includes a product line of tools for reducing shedding as well as grooming tools, care products for animals hair, for washing and hygienics. FURminator brand belongs to Spectrum Brands, Inc., which was founded as a successor of Rayovac Corporation. FURminator manufactures its products from high-quality materials and you can buy these products only in specialized retail stores all over the world. Therefore, now you have high-quality solutions you can use when taking care of your pet, which also improves relationships between a pet and its owner and makes grooming more comfortable, than it has ever been. What is FURminator for dogs for? 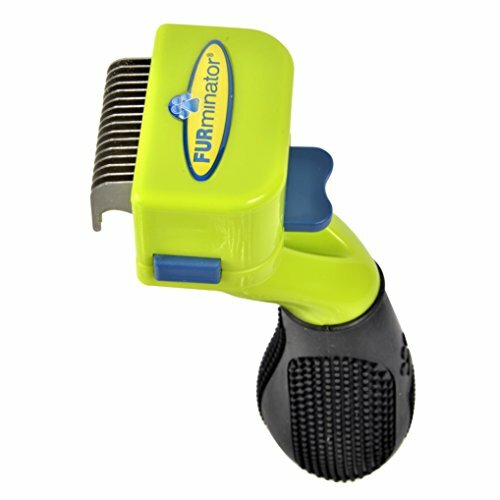 FURminator – is a tool for removing dead hair and undercoat first of all. The device consists of a handle and a blade with small curved teeth. The latter have a special shape, which allows to pick up and take the hairs out from the dog’s undercoat. As for the device appearance – it resembles the one of a safety razor just a bit enlarged. The main advantage of FURminator is that it doesn’t damage beard hair, but at that it removes fur and undercoat hair very efficiently. Due to regular usage of the device you can decrease the amount of shedding hair by 10 times. 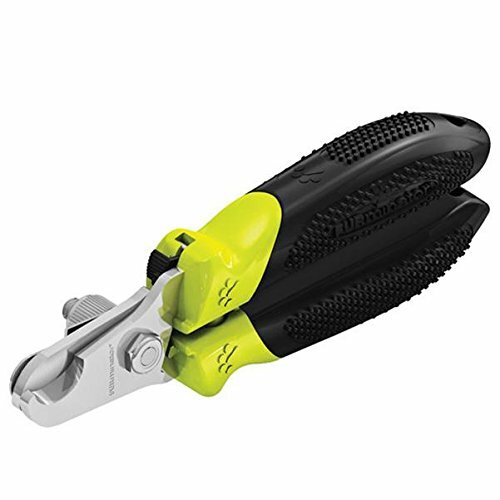 Up to 90% of shed hair-coat covering is removed with the help of this tool after using it 2-4 times during 7-10 days. No other tool including manual plucking hair out can show such efficiency and results. FURminator allows solving the problem of the hair scattered all over the house, on the furniture, floor and clothes and it also improves dog’s appearance. 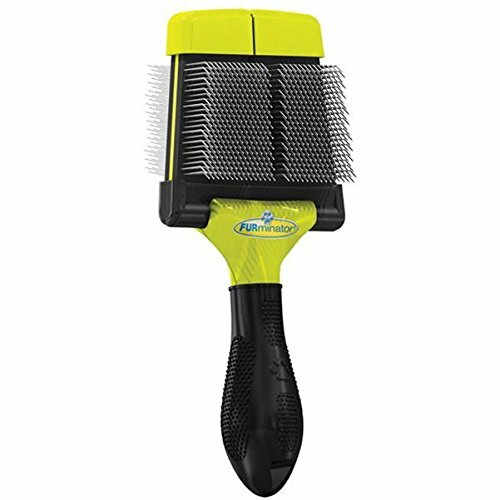 This is a professional grooming tool for animals with pronounced undercoat. However, not only professional groomer can work with it, but the dog’s owner as well. The device allows efficient removing of undercoat during shedding period. It works only against dead hair of dog’s undercoat and leaves live beard hair and undercoat hair untouched. The device removes only dead fur and doesn’t touch live hair of your pet. FURminator is a perfect preventive against matted hair. Using the device regularly ensures that there’s almost no chance for polish plaits to appear. This grooming tool is easy to use, it doesn’t require any special skills. Another significant fact is, that when using FURminator it’s almost impossible to hurt the pet. This tool is absolutely safe. The device is irreplaceable not only for pets who participate in shows, it will also be of great use for all owners of long-haired pets. 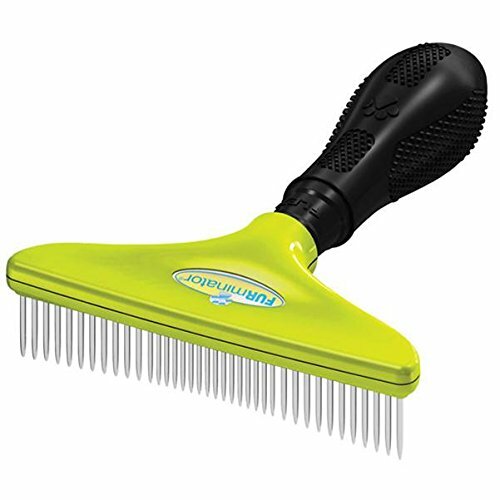 This tool removes shed undercoat and frees the dog from unnecessary fur and hair, prevents appearance of matted hair and polish plaits as well as scattering of dog’s hair all over the house. Now your pet doesn’t suffer from overheating in summer, when old matted hair stops proper heat exchange and dermal respiration of a dog, which is a very developed one. In winter the dog doesn’t get cold, because nothing stops good and healthy hair from growing. Matted hair quite often becomes a home for different external parasites, it gets clogged with dust and dirt. Using of FURminator allows both the dog and its owner get rid of this problems. When you are applying FURminator surface skin fat is distributed uniformly along the hair length – this is another big merit that you get! After several procedures your pet’s hair becomes bright and more elastic, stops being greasy near roots and dry at ends. 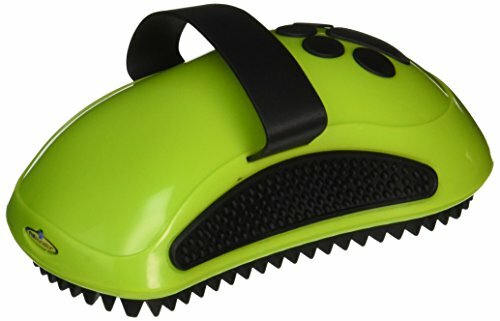 FURminator massages the skin, which improves blood circulation and nutrient enrichment of hair. Removed dead hair doesn’t cause itching any more or stop dermal respiration and no matted hair appears. This is especially timely for long-haired dogs, if their owners want to have a healthy and appealing pet around. The operational principle of this device is that it doesn’t cut undercoat, but it picks it up and lifts above hair-coat covering without touching beard hair. 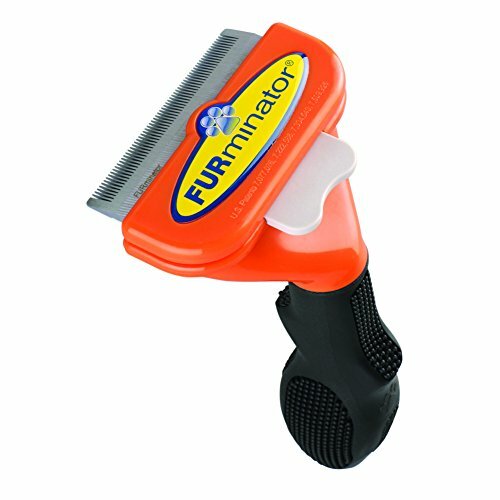 That’s why FURminator resembles a small rake, because its teeth allow beard hair to slip through them while combing a dog. The shorter is pets hair, the shorter should be teeth of FURminator and vice versa – in case of long-haired animal you’ll need tools with longer teeth. Dense short teeth will not comb siberian husky or alaskan malamute, they will get stuck in its long thick fur while long and widely-spaced teeth will not reach beagle undercoat. So, the space between the teeth is varied: the thicker is pet’s fur, the more widely-spaced the teeth should be. The less hair a pet has, the thicker should be the brush teeth. The width is varied according to dog’s size. It’s very inconvenient to brush a small dig with a large brush as well as it is tiring to brush a big dog with a tiny instrument. In case of very large dogs it’s better to get both types of brushes – large one for the body and head, small one for the tail, ears and paws. Besides, there are special FURminators for cats, horses and small sized pets. The smallest tool, as a rule, is used only for cats and rabbits. The average sized one is for small dogs and the largest one is for large dogs. If there are several pets of different size in the house, you can buy one large or average sized FURminator. FURminator is a quality brush for dogs. It has a button for immediate cleaning, rubbered handle that doesn’t slide in your hand. The brush teeth are rounded and they don’t scratch dog’s skin. If the tool you bought is inconvenient to use or it has sharp teeth, it’s better not to use it. You should give preference to devices with self-grinding blades, since they serve much longer. FURminator for dogs can be chosen directly for a certain pet taking into account its size, length and fur thickness. The brush teeth shouldn’t have any notches or scaliness, since in this case they’ll grab hair and pull it, which hurts the dog and causes bald patches and even skin injuries. You should train your pet to grooming gradually from the early childhood. You should try to brush a puppy when it’s playing. If it gets scared, you should pity and stroke the puppy. If it is ok with brushing, you should praise it and give something tasty. If the dog hasn’t been trained to brushing since early age, it may actively resist the procedure or get very scared. If any hygienic procedure is a stress for a dog, it’s better not to make things worse by forcing it, just invite a professional groomer. He uses some light sedative substances and while the dog sleeps, he is grooming its hair and combs it. Don’t expect the fur and hair to go away themselves and leave the dog alone: excess of shed undercoat that is still on the dog is inconvenient both for the dog and its owner. Pet’s fur has to be clean, without dust, matted hair or various plants burrs. There shouldn’t be any sores, slight wounds, scratches, bites, grazes on dog’s skin. It’s desirable to wash the pet, dry its hair, comb it with an ordinary brush and only after that use a FURminator. If the hair is dirty, clogged with dust, FURminator teeth will get clogged as well and the blade will cut beard hair. This will significantly worsen the quality of pet’s hair-coat covering and make it not very good-looking. You have to lay or sit your pet or just leave it standing. As FURminator moves the body position will change. You should start combing carefully without pushing or scratching pet’s skin and move your hand in the direction of hair growth. Be especially careful when combing the tail, the area under it, abdomen and hindpaws internal area. A dog may spin and try to get away, since these spots are extremely sensitive, though it’s easier to comb the rest of the body. Pets with not very long hair should be combed from top downward. A long-haired dog is combed “in layers”, from the bottom upwards and go upper only when the whole row below is successfully combed. After your pet gets used to this tool and stops resisting, it will take you about 20-30 min to comb any pet, even the most fluffy one. When you quickly process a dog with this tool, it takes the process as a nice and pleasant massage. So, as some time passes, the pet will gladly come and stand still during the whole process. After you finish, you have to wash FURminator for dogs carefully with warm soapy water. You mustn’t use any grain materials, wet tissues, sponges to clean the device – they blunt the blades. These are almost all bichon, poodle, xoloitzcuintli, chinese crested dog, papillon, shih tzu, lhasa apso. Terriers — yorkshire terrier, soft-coated wheaten terrier, bedlington terrier. Also FURminator won’t do for dogs with curly hair or with polish plaits – komondor, bergamasco shepherd. FURminator won’t do for short-haired dogs, because they almost don’t have any undercoat and for them combing won’t be efficient. You should use FURminator for short-haired dogs only if you can’t remove their undercoat with a coarse mitten. As it is clear from the tool purpose it’s designed for pets with thick undercoat. Beard hair may not be thick and long, it doesn’t matter, since FURminator for dogs works only with undercoat. So, these breeds are long-haired sheep dogs – german shepherd, east european shepherd, central asian shepherd dog, caucasian shepherd dog, belgian shepherd; siberian husky, alaskan malamute, samoyed, akita, laika. As well as: spaniel; setter; schnauzer; retriever; brussels griffon; old english sheepdog; st. Bernard. It’s recommended to perform preventive treatment of a dog once in a month and when the dog is shedding you should do it more often when necessary. Proper treatment won’t hurt your pet’s health, it is the opposite – using FURminator as often as necessary ensures growth of healthy hair and improves your pet’s appearance. As you may see FURminator is quite a simple device. However, the company has a wide range of pet care products, that includes various shampoos, brushes and tools for claws care. Below, I will review several products for dog’s hair care, which will definitely make the owner’s life easier. In fact, here is the whole set of the products made by FURminator company. These are deShedding Tools of the following size: Extra Small, Small, Medium, Large and giant. They are both for long-haired and short-haired dogs. This is the main tool to take care of dog’s hair during shedding season. This is the second necessary device in a toolkit of any dog-fancier. You can use it to remove matted hair without hurting a dog. This is a must have device! This is a rake with gap-tooth for comfortable brushing of dog’s hair and removing matted hair. 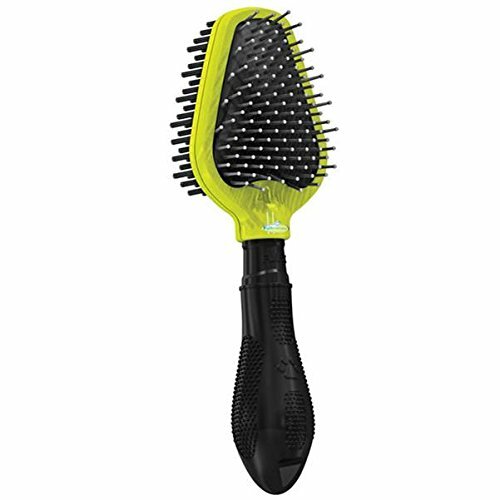 This is a double-sided brush for dogs with thick and harsh hair, for large and giant breeds. This brush is used to remove undercoat and reduce shedding period from one side and a comb for everyday care on the other side. This is a professional tool for dividing and removing tangles in short and average length hair. The comb helps to remove dust and lost hair. The comb teeth stimulate natural production of surface skin fat, which ensures healthy hair. Antibacterial plastic destroys harmful microorganisms and bacteria. This is an excellent tool for pets with short silky hair. It removes matted and tangled hair as well as shed hair. It efficiently moves away dirt, provides good hair care and makes long hair shiny and bright. The brush has two sides: with spikes on one side and natural bristles on the other. The tool was designed using FURflex technology to follow the lines of pet’s head and body. Antibacterial plastic minimizes level of bacteria and microorganisms on pet’s body. Unlike the previous product this shampoo has received very good feedback from users. What it is aimed at is clear from its name. The shampoo contains aloe vera that kills harmful bacteria causing foul smell of dog’s skin and fur. It also eliminates other organic smells. It provides moisturization and deodorization of dog’s hair, reduces shedding, gently cleans dog’s hair and makes it healthy and shiny. The fresh smell after washing stays for a long time. 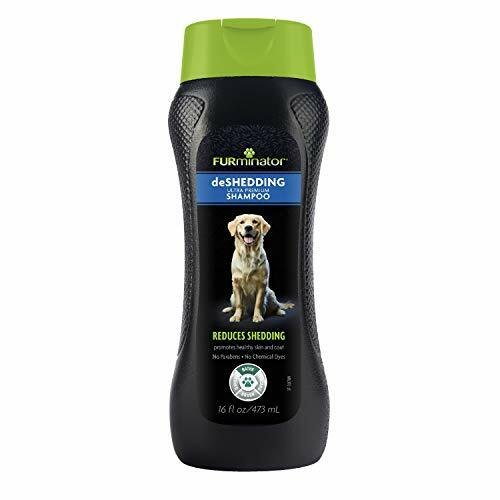 This dog conditioner based on natural components conditions dog’s hair very well and ensures reduce of shedding by washing out shed hair timely. 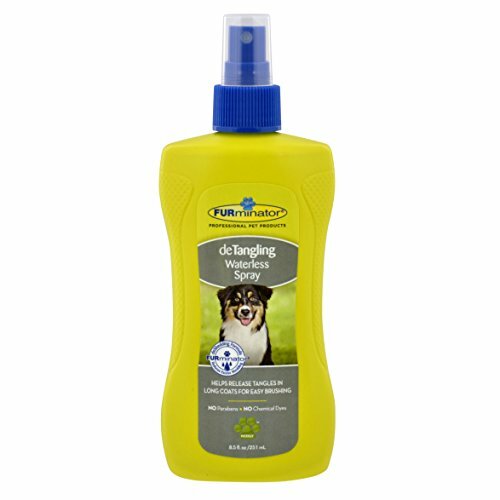 This conditioner is enriched with omega-3 and omega-6 fatty acids, chamomile and aloe vera extracts, that improve overall condition of dog’s hair, make it bright and elastic again. 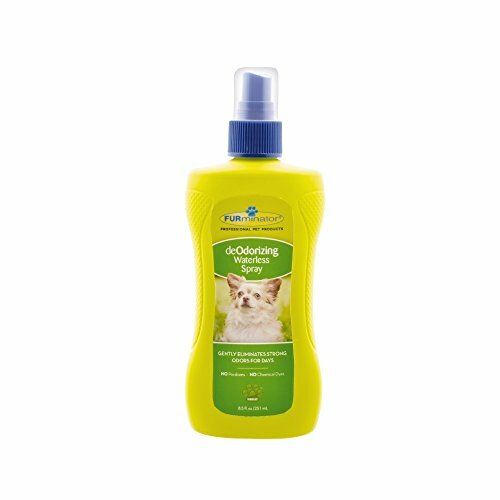 The conditioner may be used for puppies and kittens from the age of 6 weeks. This dog’s spray doesn’t require washing away. 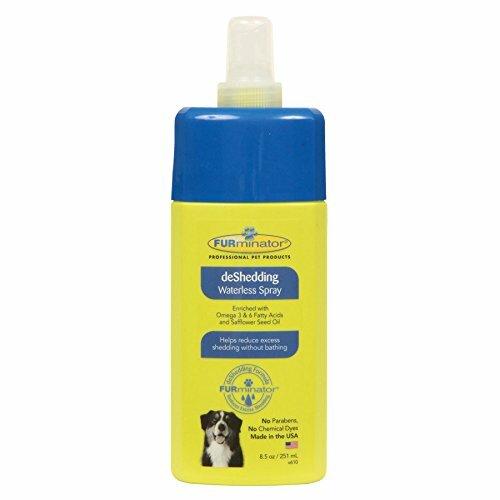 It cleans, moisturizes, makes dog’s hair shiny and removes odor from it. This spray performs soothing effect on irritated skin.